Need to repair your bike on campus? The Students’ Union is here to get you back on the road. 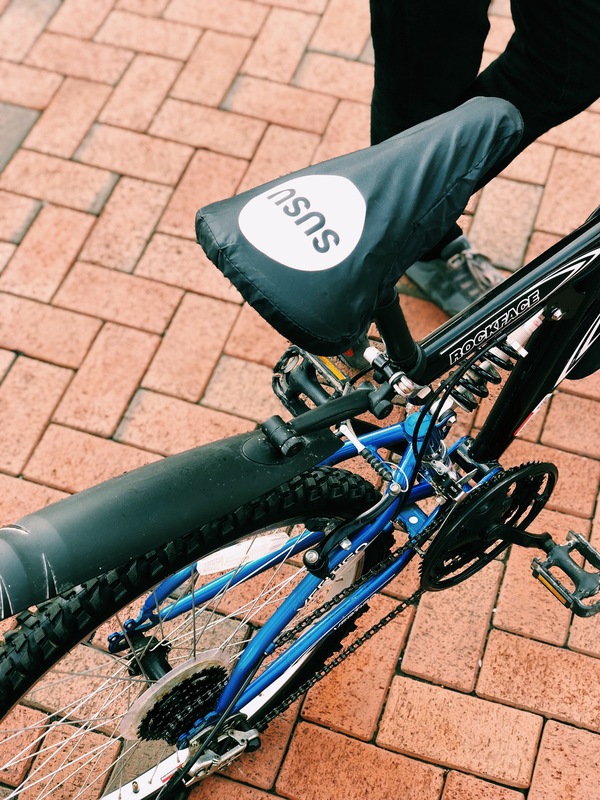 The Union now offers bike pumps, tools and flat repair kits to all students. You can now pop along to the Union reception in building 42 if you need to get your bike back in shape. Great success! This win was brought to you from You Make Change. You can submit your own ideas for change by clicking here. Come and delight your taste buds with a selection of the finest cheeses Hampshire has to offer, personally selected by our Michelin trained chef at The Bridge. 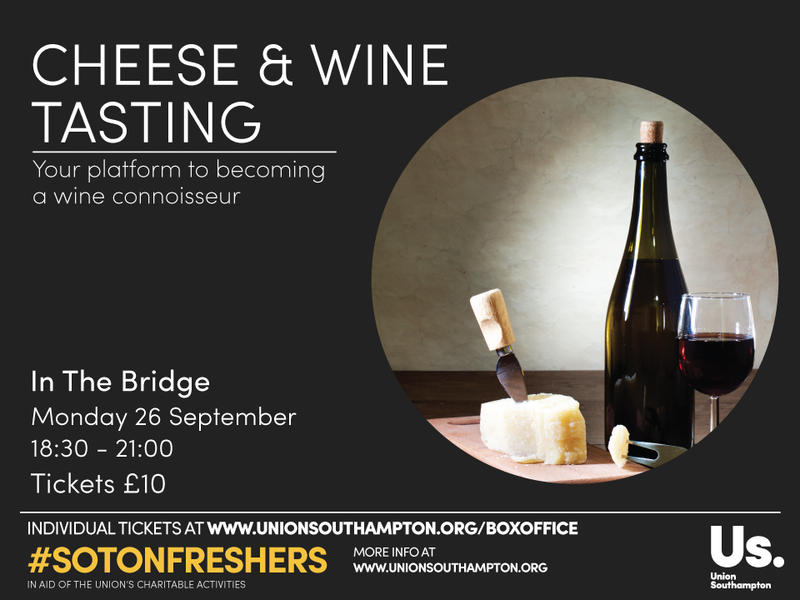 A panel of experts will also be showcasing a wide range of refined wines from our Bridge Bar. Join us for a night of culinary sophistication and elegance with a little “je ne sais quoi” of French culture. Find out more on our official Facebook event. 6,000 students. 10 huge events. 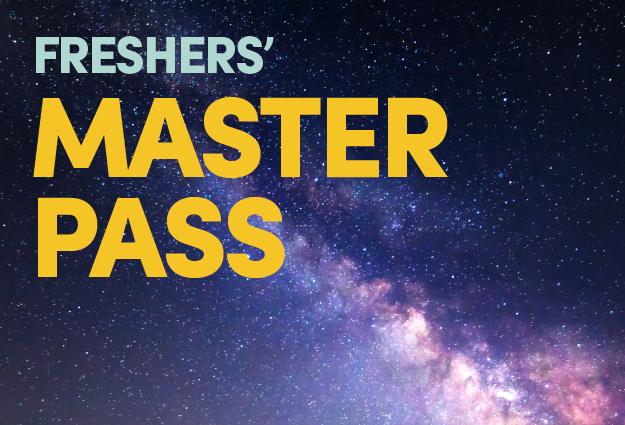 1 Master Pass. We have been rolling out our new brand identity this week across our campuses. We started by changing the buildings’ external signs, before heading out on a roadshow to WSA and Avenue to showcase the new brand and give you a chance to ask us any questions. 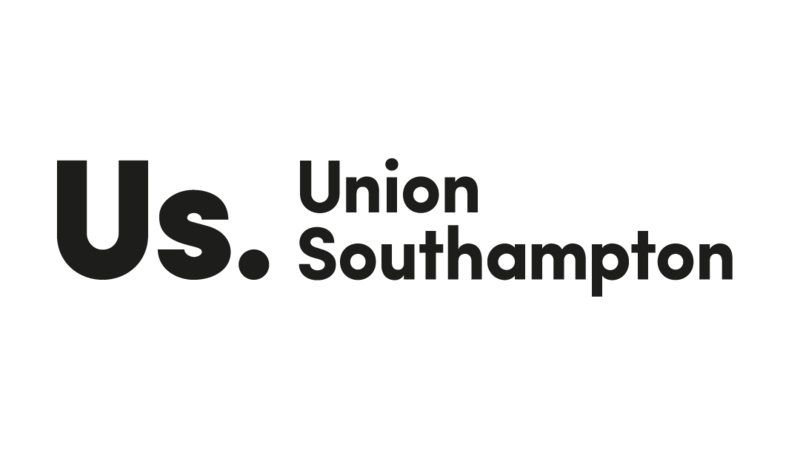 Today marks our official Highfield launch of Union Southampton. 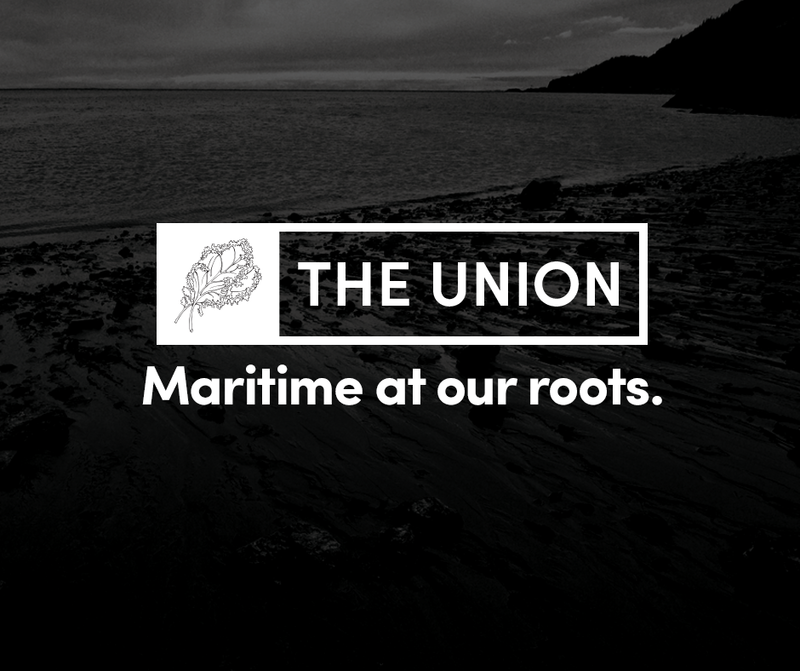 Please stop by the Redbrick from 11:00 to chat with us about the brand and for an opportunity to get creative by putting your own stamp on the new face of the Union. 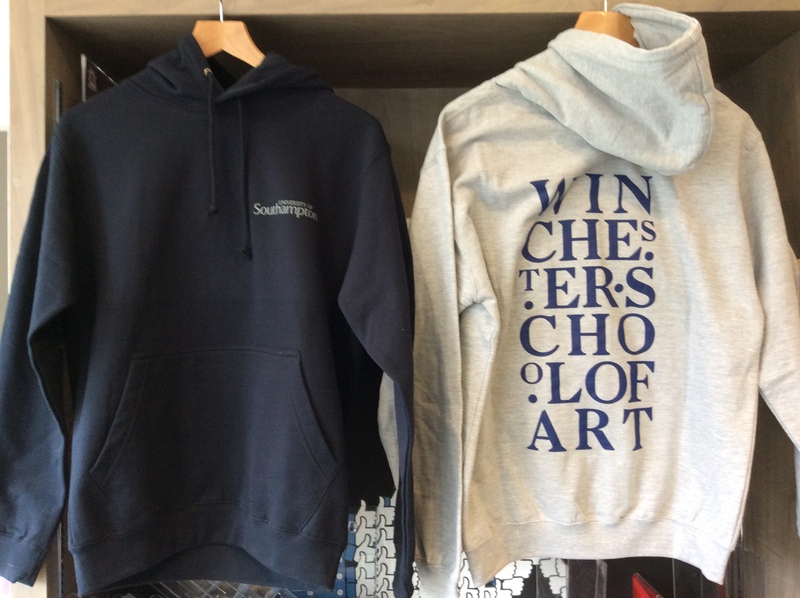 You asked us for WSA branded hoodies, so we made an order last semester. The hoodies were so popular, we completely SOLD OUT, so we have put in a further order which will be due to arrive in the final week in April. April Fools’ Spoiler: Unveiling the new brand…just kidding! If you fell foul of our April Fools’ prank earlier today, let us reassure you that as great as the faux-brand is, the actual brand will be much more comprehensive! Interestingly, according to Peter Holden who works for Holden’s Agency, Southampton is well-known for its sea kale exports. Therefore the faux-brand has been inspired by the city’s maritime heritage. Look out for more information about the next stage of the REAL brand coming soon! As you may know, for the last few months we have been in the midst of a rebrand. We appointed Manchester-based branding agency Holdens’ to work with us on the new brand concepts using the Ted’s Talks, branding workshops and a survey which received 2,562 responses to gain your views. We bet you can’t wait for the Easter break – 2016 seems to be flying by and it isn’t long to go now. The break starts from Sunday 20 March 2016 and will last until Sunday 17 April 2016. 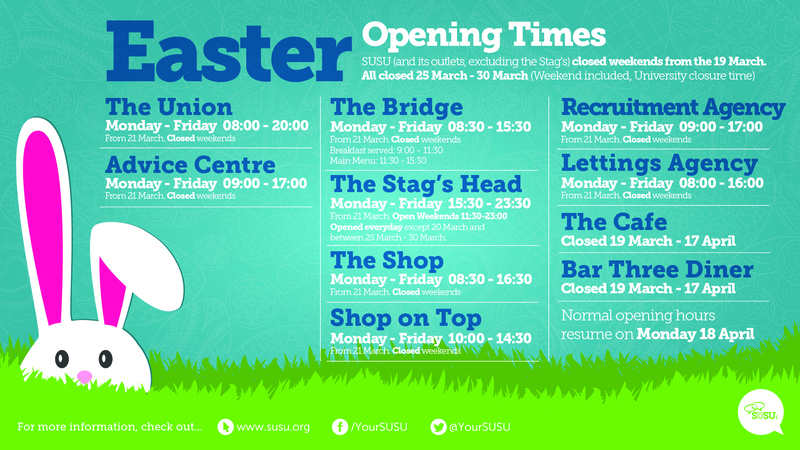 The University will be open throughout the break apart from the Easter weekend – 25-28 March, followed by the closure days on Tuesday and Wednesday, 29-30 March 2016. The holidays are approaching and you are about to embark on a well-deserved break. Like yourselves, we will be resting up ready for 2016. 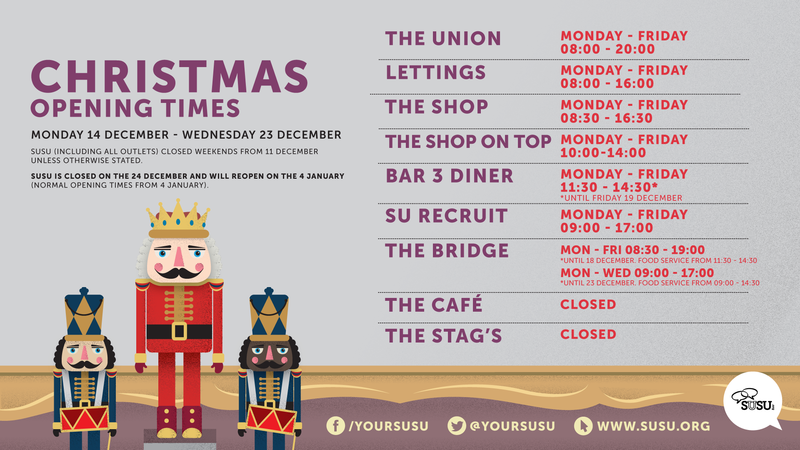 Here are the Christmas opening times at the Students’ Union between Monday 14th December-Wednesday 23rd December. SUSU (including all outlets) is closed weekends from 11th December unless otherwise stated.